December – GMC donated GBP 100 to Catherine Ching who completed Marathon Walk from Nice to Cannes to raise money for Get Kids Going. The charity encourages disabled children to compete by supporting them with their sports; training, physiotherapy, travel, design and development of sports’ wheelchairs. Learn more about Get Kids Going from their website. November – GMC donated GBP 100 to Simon Maquire who participated in “Movember” to raise money for The Prostate Cancer Charity. One of the largest and most comprehensive charities in the UK, it plays a key role in raising both public awareness of the disease and political debate about support and services. Learn more about The Prostate Cancer Charity from their website. November – GMC donated GBP 100 to Justin Hodgson who ran the New York Marathon to raise funds for Get Kids Going.The charity helps disabled children take part in sport by providing specialist sports wheelchairs, sports grants and year round support. Learn more about Get Kids Going activities from their website. October – GMC raised GBP 1,640 for the British Red Cross to support humanitarian efforts following an earthquake in China’s Sichuan Province. The earthquake struck on May 12, 2008 with devastating impact on the lives and livelihood of millions of people. Visit British Red Cross website for more information. September – GMC donated GBP 100 to Maggie’s Cancer Caring Centre in support of Catherine Ching and Sachin Goel on their 20 mile London Night Hike. Learn more about Maggie’s on their website. August – GMC donated GBP 200 to Monika Miksakova, GMC Business Manager, and James Wilmot who participated in the Mazda London Triathlon 2008 to raise funds for Christian Lewis Trust and Barnardo’s respectively. Visit Christian Lewis Trust and Barnardo’s for more information. 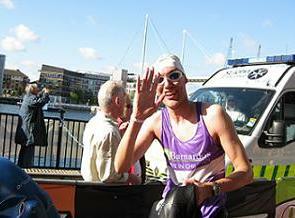 August – Sachin Goel and Catherine Ching helped to maintain order at one of the worlds largest sporting events by acting as voluntary race marshals in the Mazda London Triathlon on 6th & 7th August 2008. June – GMC sponsored (GBP 100) Mohit Midha who has participated in the British 10K run to raise money for the Pratham Charity which aims to raise awareness and funds for Pratham’s activities, such as developing the education system for children in India. For more information about their activities visit the Pratham website. June – GMC donated GBP 100 to Graeme Grass who is taking part in the Three Peaks Challenge in aid of London and Capital Foundation. The charity has supported many great projects with a mission to “Help relieve poverty and sickness in children, worldwide”. To learn more about their projects visit the London and Capital Foundation website. June – GMC will sponsor the celebrations of Thurrock Lions – the youth football team that won over 20 matches in the last year. To find out more, visit the Thurrock Football Club website. April – GMC donated GBP 100 to Dorota Drozdowska, GMC employee, who participated in The 2008 Flora London Marathon. Dorota raised over GBP 1,000 for the Redress charity, a human rights organisation that helps torture survivors obtain justice and reparation and restore their dignity. Visit the Redress website to find out more. March – GMC donated GBP 250 towards John Plester’s sponsored swim that he took part in. As a school governor he raised money for the replacement of Earls Colne Primary School’s swimming pool. You can learn more about Earls Colne Primary School from their website. 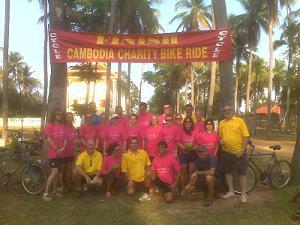 February – Prem Goyal set off on a 10 day cycling ride through Vietnam and Cambodia to raise GBP 5,000 for Breast Cancer Care. Money raised will go towards funding the charity support and information service, which include a national helpline, website, publications and practical and emotional support for those affected by breast cancer. For more information about their work visit the Breast Cancer Care website. January – Our colleague Prem Goyal financially supported (GBP 235) the House With No Steps Charity. House With No Steps is a project of The Wheelchair and Disabled Association of Australia to provide quality support services for people with disabilities. It also provides training to those who provide care and support to people with disabilities. You can learn more from the House With No Steps website.